This will be a deeply ambivalent review. I’ll explain. 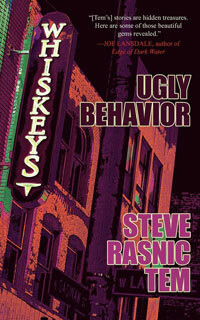 Ugly Behavior, a collection of murder stories by dark fantasy author Steve Rasnic Tem, was not an easy read. This isn’t on its face a bad thing. In fact, I am slow when it comes to reading a short story collection. I might read a novel in an afternoon. A collection will take me a month, often more. I’ll read one at a time, two if I’m focused. It took me over three months to finish Ugly Behavior. I had other books, novels, to review—and I prefer novels to short stories. But there’s another reason that this book was a hard read: these stories are brutal. Ugly Behavior seems to have been, in hindsight, an understatement. Rasnic Tem—I feel the impulse to write his full name just to be safe—Steve Rasnic Tem has a very dark, very violent, very creepy imagination. Very violent. I’ve read enough crime fiction to have experience with literary brutality. I’d like to think that I've read some of the best. And rarely have I been moved by it. So, well played, sir. Steve Rasnic Tem—“SRT”?—doesn’t employ gore. This isn’t cheap violence. This is carefully crafted brutality, not the comic carnage of Hannibal. The actual violence in the stories is, on the surface level, unrealistic, almost absurd. Cigarette burns around a woman’s eyes, a women pricked with a bladed cane, women crushed, women squeezed—there’s a lot of violence against women, which I’ll get to. But Rasnic Tem’s writes very well. So regardless the method, the deaths provoked revulsion at some points, shock at others. Again, well played, sir. Clive Barker conjuring Jim Thompson. Ugly Behavior is effective. I should mention the stories themselves. They seemed largely to revolve around two themes: love and bodies. Bodies decaying, bodies disfigured, bodies scarred. The giant hands of the hero of “The Crusher,” who fears what they’ll do if he holds a woman. “The Stench” concerns a man driven mad by the odors of the city—especially those emanating from its female citizens. In “Jesse,” a Huckleberryesque killing spree drives one teen to see rot and decay wherever he and his murderous buddy go. The killer in "Stones" feels his body turning, or rather returning, to stone, while the GG Alin-like hero of “Ugly Behavior” does, well, he uses his body to do what GG Alin did. Bodies, bodily fluids, bodily decay. Things that disgust are a big part of the book. So is love, particularly between a man and a woman, husbands and wives, fathers and daughters, killers and victims. The murdered in Ugly Behavior are almost all women. But not just women, very weak women, perhaps even inherent victims. Women as targets of male violence. I do not want to imply that Steve Rasnic Tem is in any way a misogynist. And he certainly does not portray female characters as hateful, as deserving what they get. In fact, his portrayals of women appear largely sympathetic. His best, Jane the paranoid heroine or “Sharp Edges,” is a qualified victim, but she—I can’t say more without spoiling the story. Even in Ugly Behavior’s two best entries—“Saguaro Night” and “Living Arrangements,” heartfelt, but violent, stories about fathers and daughters—the women are sympathetic, yet powerless, dependent on men to rescue or avenge them. And ultimately scarred and bruised by the men they love. Given crime fiction’s troubling history with glorifying violence against women, I am wary of this. And perhaps that’s why I am ambivalent about this collection. But, Rasnic Tem—I hope someone corrects me so I can reedit it on the sly—is a truly skilled writer. These stories were generally creepy and sometimes terrifying. The absurdity of the aging child killer in “The Child Killer” made for one of the better stories in the collection. Bonus for that story's nod to Buffalo Bill’s layer/labyrinth from Silence of the Lambs. And “The Rat Catcher.” Perhaps the oddest story in Ugly Behavior—which is saying something. This is a collection of well-written brutality. I appreciated the artistry. I just didn’t feel very good about the world after reading it.